HORSE BONE SHOWING HEALED INJURY - PLEISTOCENE NORTH SEA. 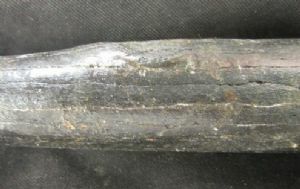 HORSE BONE SHOWING HEALED INJURY - PLEISTOCENE, NORTH SEA. Complete rear cannon bone (metatarsal) from an adult ice Age Horse. Just below the mid-point on the leading edge is an elliptical swollen lump. This is the site of an injury to the animal's hocks during life. The swelling or Haematoma later ossified. Such injuries could have proved fatal if more serious as an injured animal would be easy prey for any predators around. Superb example of pathology.